Robotics Project Kits offered by our organization is highly acclaimed among the clients. This is available in the range such as Metal Detector Robotic Vehicle, Obstacle Avoidance Robotic Vehicle, Fire Fighting Robotic Vehicle and others. 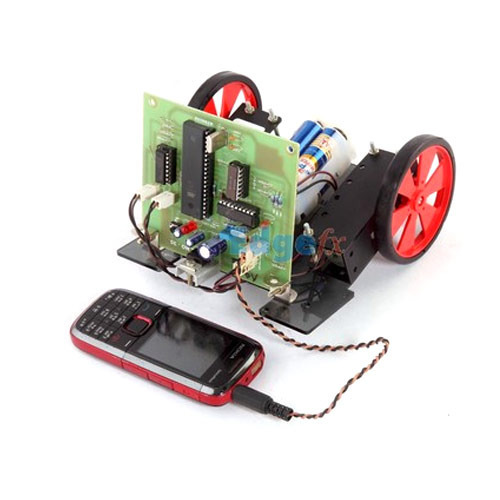 Cell Phone Controlled Robotic Vehicle: The project is designed to develop a robotic vehicle that is controlled by a cell phone. DTMF commands from a phone is sent to another cell phone which is mounted on the robot. These commands are fed to a micro-controller of 8051 family to operate the vehicle movement through motor interface. Robotic Vehicle Metal Detector: The project is designed to develop a robotic vehicle that can sense land mines ahead of it. The robot is controlled by a remote using RF technology. It consists of a metal detector circuit interfaced to the control unit that alarms the user behind it about a suspected land mine ahead. An 8051 series of microcontroller is used for the desired operation. Obstacle Avoidance Robotic Vehicle: Ultrasonic sensor based robotic vehicle that avoids any obstacle and changes its direction as required. A micro-controller of 8051 family is used for achieving the desired function. Auto Metro Train To Shuttle Between Stations: A robotic vehicle considered as train is connected with sensors for shuttling between two stations automatically. It has provision for limiting the number of passengers entering the train by auto door management system. Auto start and stop feature from origin to the destination and back is also available. Metal Detector Robotic Vehicle Operated By Android Application: The project is designed to control a robotic vehicle using motors interfaced to a micro-controller through remotely operated commands to it by touch screen based user friendly GUI on any smart phone with Android applications. It also consists of a metal detector circuit interfaced to the control unit that alarms the user behind it about a suspected land mine ahead. Android Application Controlled Remote Robot Operation: The project is designed to control a robotic vehicle using motors interfaced to a microcontroller through remotely operated commands to it by touch screen based user friendly GUI on any smart phone with Android applications. War Field Spying Robot With Night Vision Wireless Camera By Android Applications: The project is designed to develop a robotic vehicle using motors those are interfaced to a microcontroller through remotely operated commands to it by touch screen based user friendly GUI on any smart phone with Android applications and with wireless camera for monitoring purpose. The robot along with camera can wirelessly transmit real time video with night vision capabilities. This is kind of robot can be used for spying purpose in war fields. Voice Controlled Robotic Vehicle With Long Distance Speech Recognition: A robotic vehicle that responds to voice commands with RF mode communication for long distance speech recognition features for movement in any direction with manual override by switches at the transmitter end. Pick N Place Robotic Arm And Movement Controlled By Android Wirelessly: The project is designed to develop a pick n place robotic vehicle with a soft catching gripper. For example, it can safely handle a bomb very carefully to avoid explosion while catching. The robotic vehicle 4 motors are interfaced to a micro-controller through remotely operated commands to it by touch screen based user friendly GUI on any smart phone with Android applications. Fire Fighting Robotic Vehicle: The project is designed to develop a fire fighting robot using RF technology for remote operation. The robotic vehicle is loaded with water tanker and a pump which is controlled over wireless communication to throw water. An 8051 series of micro-controller is used for the desired operation.